Every now and then I get the worst craving for nachos, usually during Monday Night Football or on snow days. I made chili-roasted broccoli & grape tomato nachos, with garlic and a mix of cheddar and mozzarella cheese. And when I make them myself, for just me, I can make them how I like them - with a very thin & even layer of cheese over all the chips, a layer of roasted veg, a sprinkle of cheese over the top, and the whole thing dusted with chili powder. Then baked until the cheese is melted and the outer edge chips are almost toasted. Now, I can't help trying to eat them all, but inevitably I make more than I can really eat. Which is fine, because leftover nachos are like leftover pizza: even better cold and eaten in the morning for breakfast! For dinner tonight I sauteed some tiny little gnocchi and made a little tomato sauce with garlic and smoked paprika to go with it. I had a small glass of wine and sat down with my copy of Simca's Cuisine. I love this cookbook, which is why I permanently "borrowed" it from La Maman. 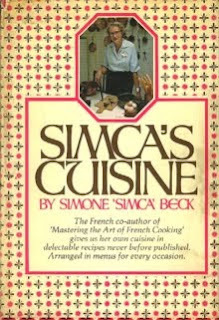 This cookbook reads marvelously, it's as though Simca (Simone Beck) is talking to you directly: a lovely French Tantine who explains what her "trucs" are and encourages you to make a mayonnaise and to go for brisk winter walks through the woods. The nice thing about this particular cookbook is that it is arranged by menu, rather than by recipe, which takes the recipe mix-and-match conundrum off the table so to speak. I admit to being horrible at menu planning. It stresses me out. 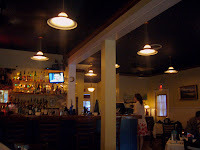 Where: Blue Moon Bistro - a place Pam recommended when I told her I was going "down Cape" for the weekend. I had the Duck Liver mousse with a gorgeous wine gelee on top. The mousse was lovely and soft, which paired nicely with the strong wine gelee. The only thing I might do differently would be to serve it with slight less hard toasts. They really were a teeth-breaking kind of hard and I just ended up eating the mousse with a fork. I am currently on vacation "Down Cape"
Just so you know, I have eaten the equivalent of a first-graders weight in food and also have gotten so blind drunk that I had 12 hours of bed spins. So until I can sort out all the photos & words, let me just leave you with this: I ate a chocolate bag. Yep, a bag made out chocolate and filled with brownie, banana, ice cream, and chocolate sauce. It was incredible.